Looking for more Holiday Party Ideas? 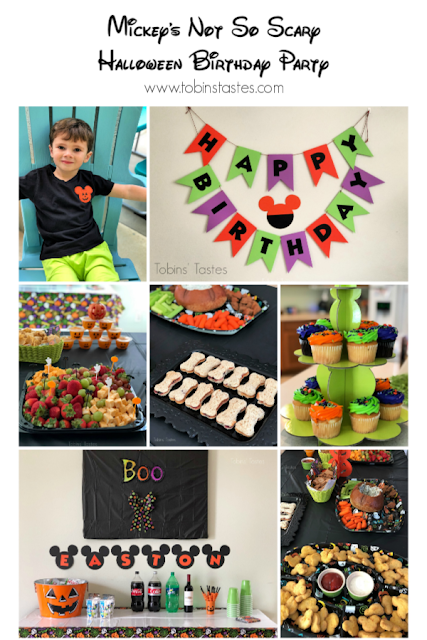 Check out all of my party plans and season recipes HERE! I bake a lot of things from scratch for the holidays. Pies aren't one of them. Every year Justin goes on and on about how he wishes I would make pies so this year I decided to make sure that he would have plenty of pie at all of his holiday celebrations. Since I have probably only made one pie in my entire life, I decided to grab a variety of Mrs. Smith's pies from Walmart to bring to our recent Friendsgiving celebration. Justin loves all pie flavors equally so I grabbed a Pumpkin, Cherry, Very Berry, Dutch Apple and Traditional Apple Pie as well as Cool Whip for topping. I also got an extra Dutch Apple and Very Berry to make mini mason jar pies too. The night before the party I baked up all the pies so that I would have minimal prep in the morning. We were helping the hostess decorate so I wanted to not be stressed out. I made an Apple Pie Spice Cool Whip to go in the mini pies and for topping the regular pie slices and I had made that the night before too. It was so nice to be able to get everything done ahead of time and Mrs. Smith's makes it so simple to bake the pies right out of the freezer. The morning of, I assembled the mason jar pies and stored them in the fridge for later. 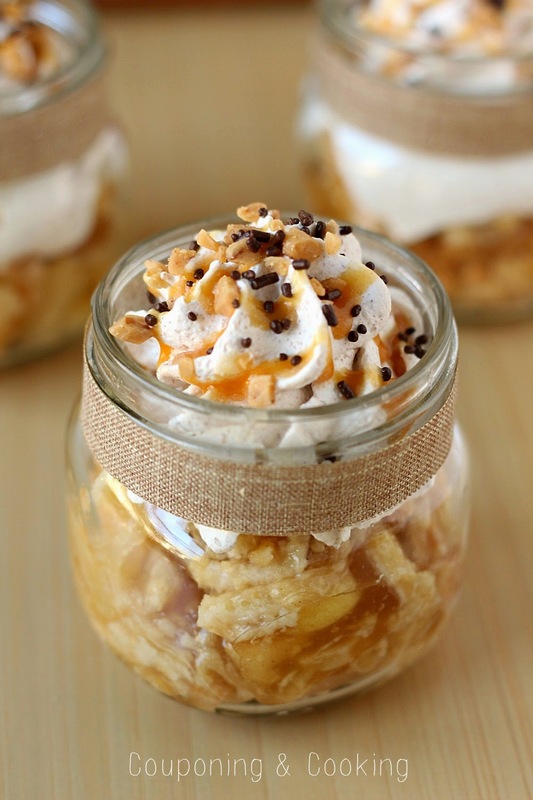 I originally made the mason jar pies for convenience since dessert is often eaten while standing around mingling and pie in a jar is way easier to eat than an actual slice is. 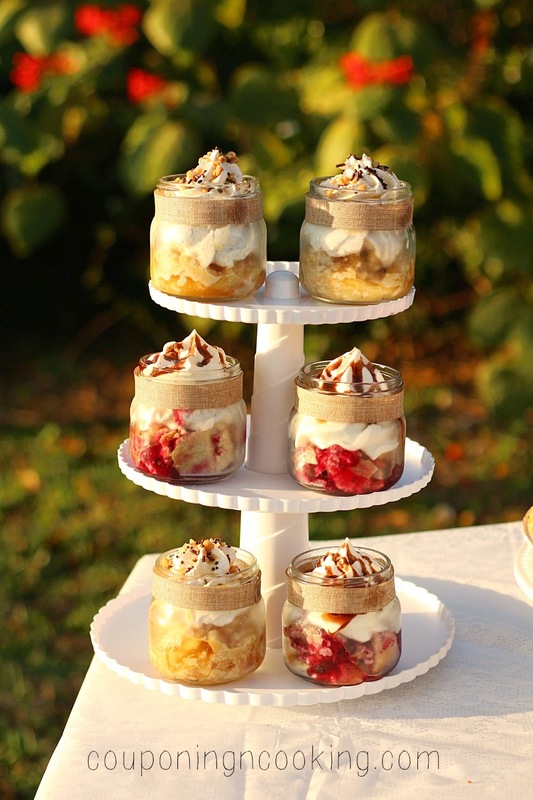 But as it turns out, the pie jars were a huge hit. Every single one was eaten. My personal favorite was the Dutch Apple with Apple Spice Cool Whip, toffee and a salted caramel drizzle but people got pretty excited about the Very Berry with chocolate sauce too. This also further proved my theory that everything tastes even better in a jar. My friend Aaron was the hostess this year and she had an adorable decor theme of burlap, whites and metallics so I decided to go with plates and napkins to match. I also added a little sparkly burlap ribbon to my mason jars. It only took a few minutes to do and it made me so happy. I think the guests appreciated it too. Stay tuned tomorrow for a Friendsgiving post with photos of all of Aaron's amazing decor and tablescape. 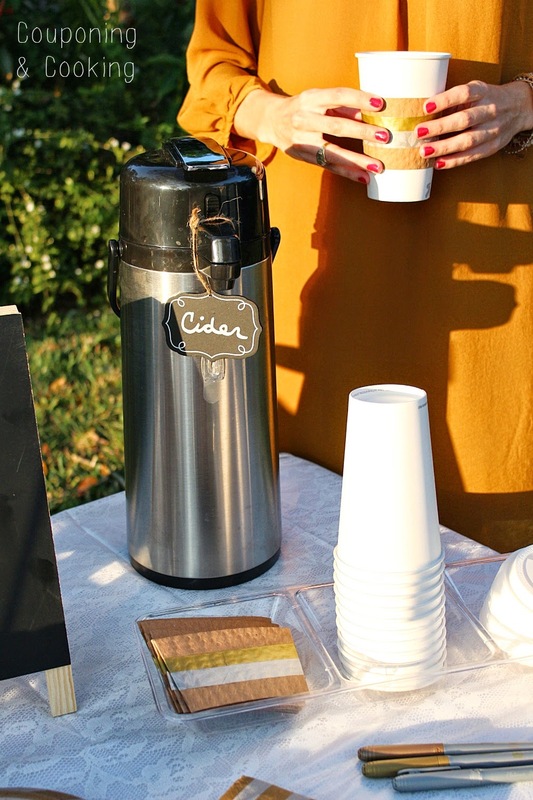 I wanted to have a little hot beverage station to go with the desserts so I pre-made some hot spiced cider and brought it over to the party in an insulated airpot and even though it was made at 3:30 in the afternoon it was still "nuclear hot" according to the guys at 10pm. I couldn't find hot beverage cups to match my plates and napkins so I bought basic white cups with coffee sleeves and added a little gold and silver washi tape to them so they would go with the decor. Little things like that make me irrationally happy when it comes to entertaining. I also put out some metallic markers so people could label their drinks (or pie plates if they were possessive like that). 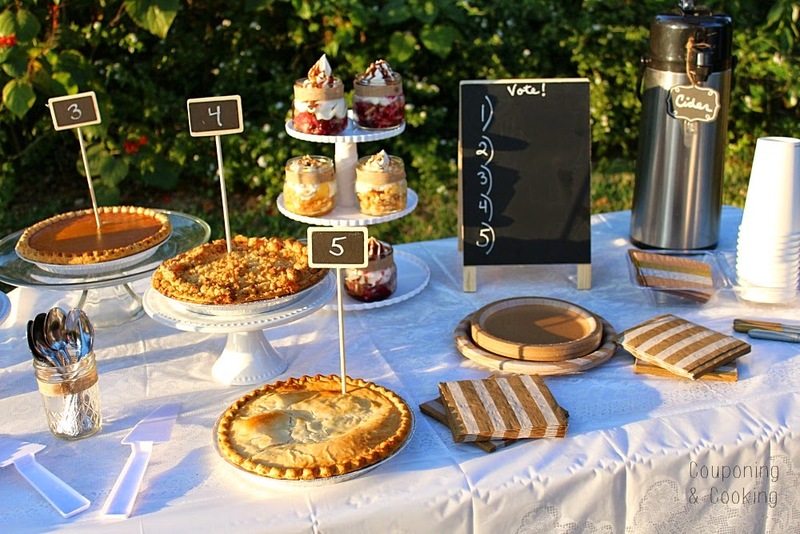 When setting up the pie table I used cake plates and three tiered dessert stands to give some height and depth to the table. I used a mason jar with burlap ribbon around it to hold my spoons and I went with disposable pie cutters and plates because I didn't want to be digging through all the trash for my servingware and it made clean up very easy. 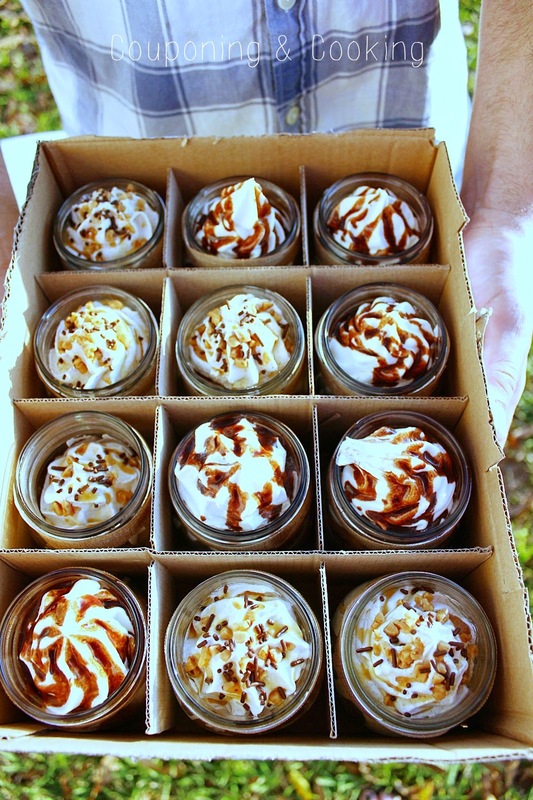 I made sure to save the box the mason jars came in because it makes for a great way to store and transport mini desserts. 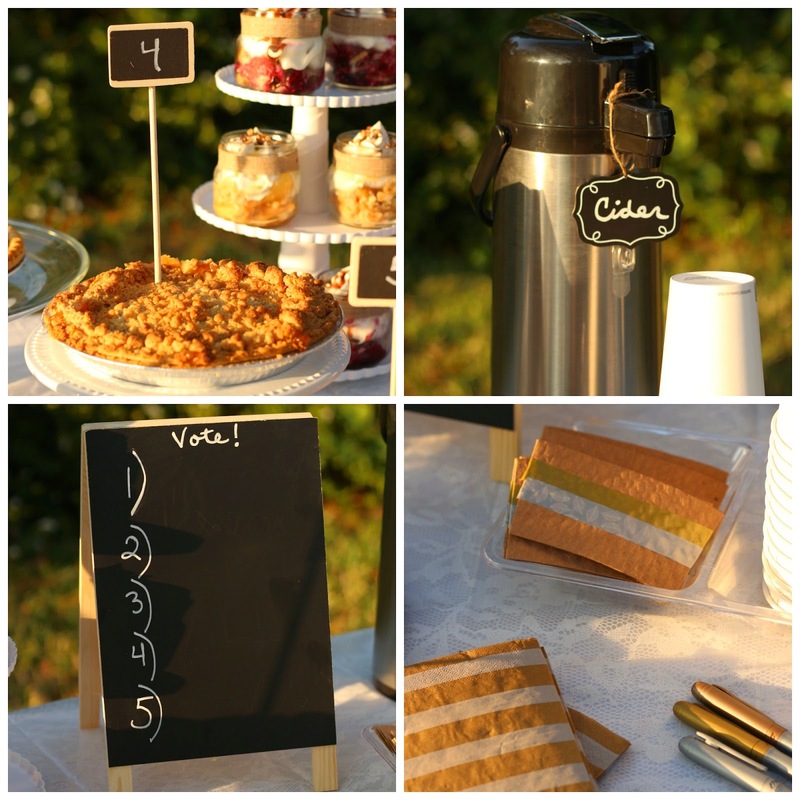 To make the dessert station interactive I set up a chalkboard voting station where guests vote for their favorite type of pie. The voting (and the majority of the dessert eating) didn't take place until well after dark so I didn't get a shot of the final tally but I am pretty sure that Dutch Apple won. 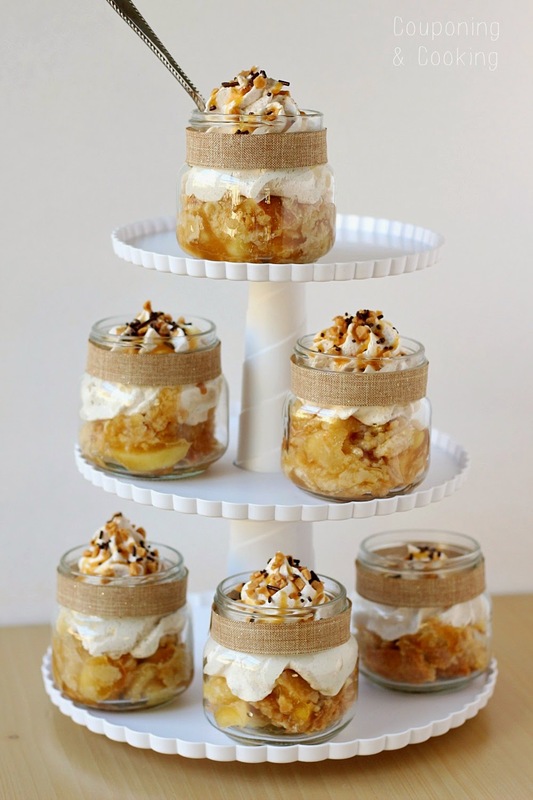 Although I am positive that if the mason jar pies had a number, they would have won by a landslide. 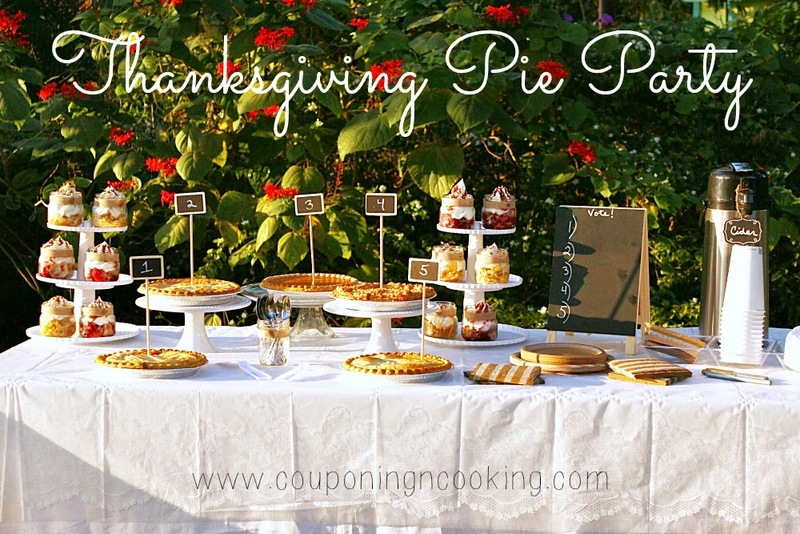 Want to save on Mrs. Smith's pies and Cool Whip for your next party? Be sure to print out this coupon to save $1.00 on Mrs. Smith’s Pie with the purchase of Cool Whip. I was able to get two prints of it and saved $2 on my purchase last week. If you need more inspiration for the holidays, check out the Cooking Up Good website. They have recipes, sweepstakes, loyalty programs, coupons and more! If you're looking for a new dinner idea or a chance to win some awesome prizes, be sure to check it out! 1.) 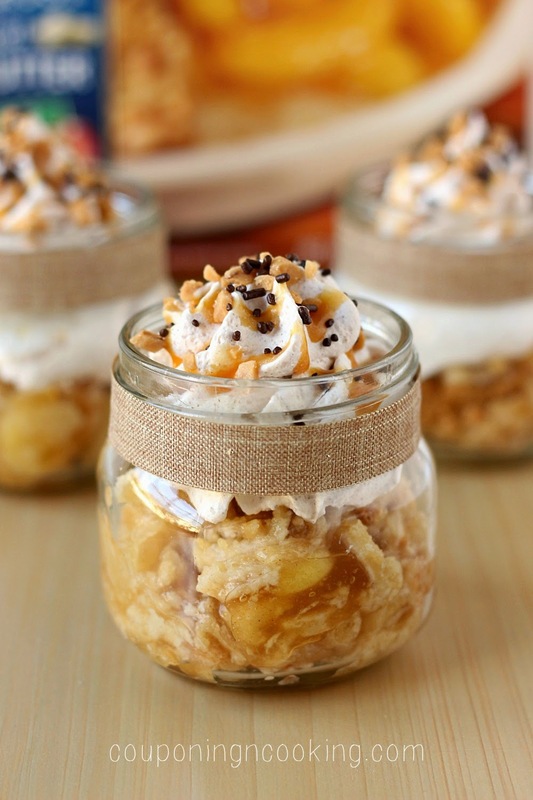 Using an ice cream scoop, scoop out two scoops of Dutch Apple pie into the bottom of the mason jar. 2.) Top with Apple Pie Spice Cool Whip, drizzle with caramel sauce and top with toffee bits and sprinkles. Store in the refrigerator. 1.) 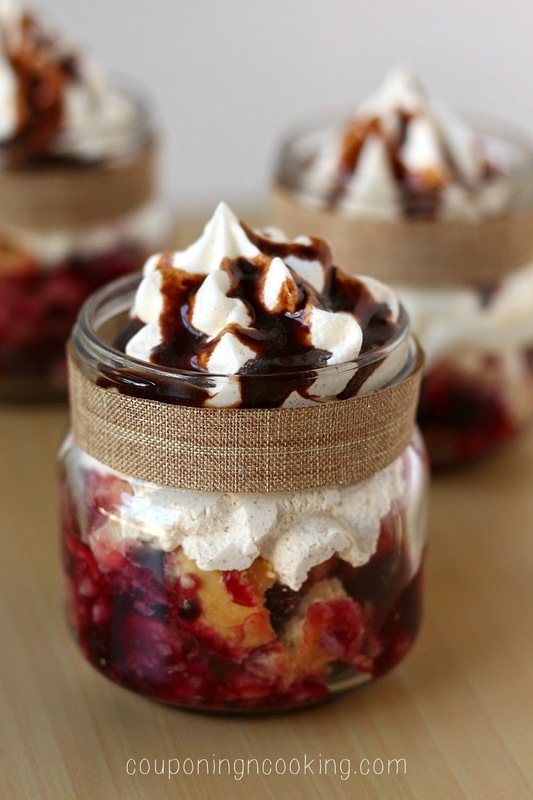 Using an ice cream scoop, scoop out two scoops of Very Berry pie into the bottom of the mason jar. 2.) Top with Cool Whip and drizzle with chocolate sauce. Store in the refrigerator. Mix 1/2 tablespoon of apple pie spice into a tub of Cool Whip. Store in the fridge. Looking for more Thankgiving dessert ideas? 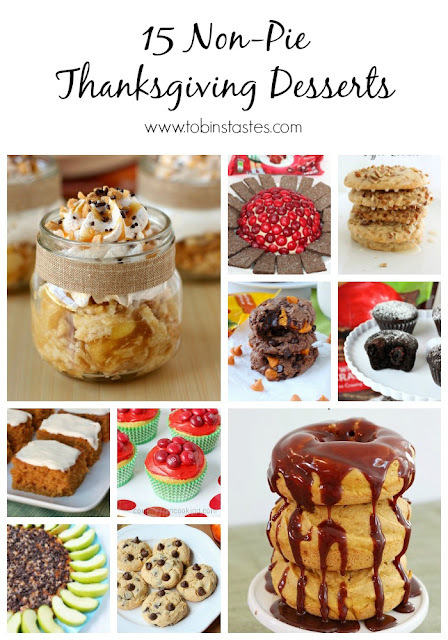 Check out these 15 non-pie recipes! This post was sponsored by Mrs. Smith's Pies & Cool Whip. All ideas and views are my own. This looks delish! Where do I find these jars? I purchased them at Walmart actually : ) They are just Ball Mason jars. I think Michaels sells them too. 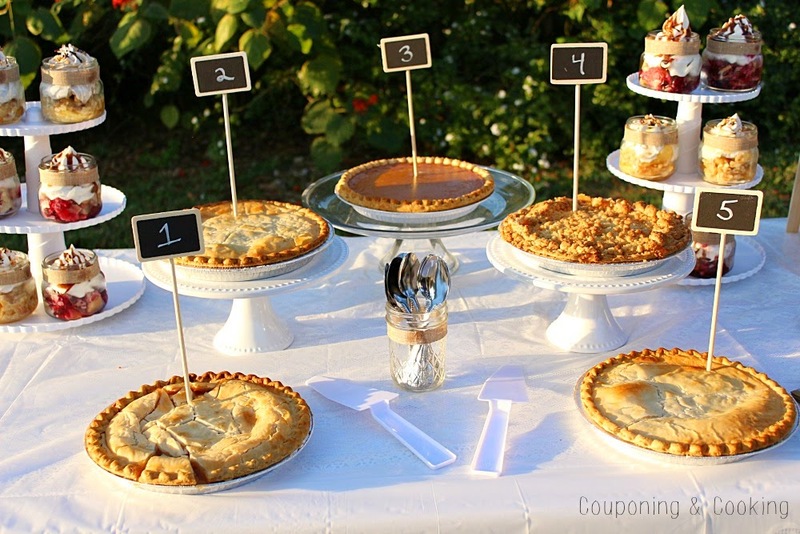 So each pie makes 6 mason jar pies? Roughly yes. 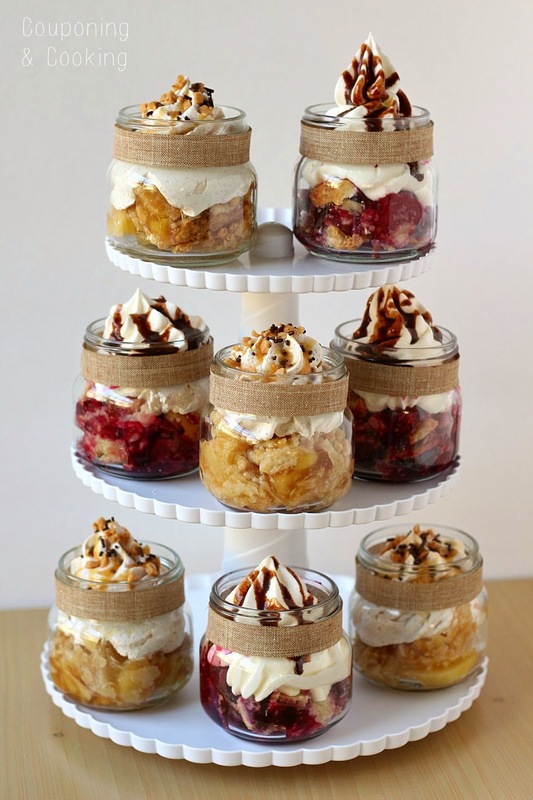 You can probably get 6-8 mason jars out of each pie depending on how big your jars are and how much you fill them. 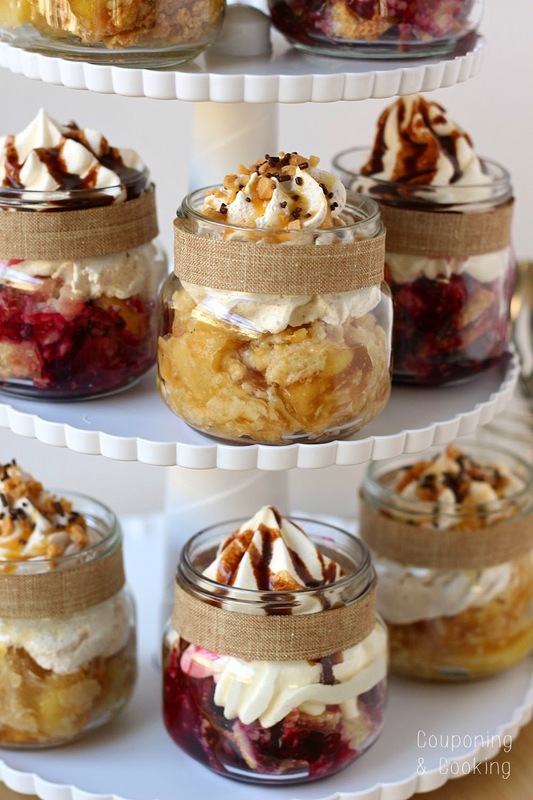 Each jar is about one slice of pie if that makes sense. Love this idea!Do you know what size (or ounces)the jars you used are? Thanks! I don't know the exact size but they are smaller- maybe 8oz? I bought them in a twelve pack with the lids at Walmart around Thanksgiving time. Hope that helps! IIT JEE 2017 Category wise Cut Off score is available. Click here to get JEE Advanced Expected Cut Off Marks. Cinema Box App is one of the greatest app it allows you to watch the HD movies on your android device, Click here to check the process of download. AP EAMCET Results 2017 has released, to get results and download score card. TS Engineering And Medical Common Entrance Test results are released, Click here to check the results and download EAMCET Rank Card. Oriental Insurance Company is a public sector general insurance firm in India. Get LIC India policy & plans online at lowest premiums. Buy Frost Free Refrigerators at India's Best Online Shopping Store. Check Price in India and Buy Online. Go here for more information. Christmas is an annual festival commemorating the birth of Jesus Christ, observed most commonly on December 25 as a religious and cultural celebration among billions of people around the world. A feast central to the Christian liturgical year,http://www.merrychristmasquotesimageswishes.com/2016/12/merry-christmas-images-pictures-wallpapers.html it is preceded by the season of Advent or the Nativity Fast and initiates the season of Christmastide, which historically in the West lasts twelve days and culminates on Twelfth Night in some traditions, Christmastide includes an Octave. Christmas Day is a public holiday in many of the world's nations, is celebrated religiously by a majority of Christians, as well as culturally by many non-Christians, and forms an integral part of the holiday season. In several countries, celebrating Christmas Eve has the main focus rather than Christmas Day. Have you had this question what do you want for christmas then check this fourm to find answers for your question. You have a a lot of spam in your comments. Sometimes it helps to get rid of those right away. CarMax is one of the best service providers for the used cars. It is United States retailers who have near 500 companies under it. Learn More in Detail, Best July 4th Gifs from our official source. Learn More in Detail, Notification on SSC CGL from our official source. Learn More in Detail, Notification on RRB ALP from our official source. The VAT has changed the system of business in UAE and most of the business trust over Auditors in Dubai near me to manage their updates yearly, monthly or even quarterly to achieve the target. Well, this year is so crucial and auditors in town are rushing to update the accounts even so fast and better manner. The leading Top 10 Auditors in UAE near me representing the honorable function of best auditing firm of this year in a surprising event. You can view our full ICOs list by looking at our comprehensive monthly ICO calendar. ICO calendar provides an ongoing list of active and upcoming ICOs . Here you can also get detailed information about upcoming ICOs and Active ICOs. You must look at coworking space in Gurgaon options from all ranges and then decide what might be best for you Another thing we do is; because we know that we require coworking industry in Gurgaon ask yourself these five questions before you finalize a coworking space in Gurgaon and Delhi because the biggest challenge is to know what is best for your office space on rent in Gurgaon and then not regretting the decision later. And share an office space easily.
. How to make a paper wallet . Paper wallet are created using a program which randomly generates a private and public key. A multi-signature wallet requires multiple keys to operate. NEO is the first decentralised app and open-sourced cryptocurrency used for running apps and executing contracts on the NEO platform. Neo Wallets is a lightweight. NEO ICO was first launched in 2014. All the sweets look super delicious, I really wanna taste all of them. Griffex is a marketplace for smart sale and purchase of cryptocurrencies, a flexible trading platform presenting an opportunity for seasoned investors, retail traders, and cryptocurrency enthusiasts at managing multi-currency investment portfolio. We adore the flexibility of trading platform with multiple cryptocurrencies, the sensational charm in new-age commerce and financing that has attracted millions towards this revolutionary mannerism of investing. However, the inefficiencies inherent the traditional crypto-exchange models, coupled with the dearth of quality tokens and lack of incentives continue to act as a bulwark against the eventual adoption of technology that has such far-reaching consequences. - Trading with a comprehensive range of cryptocurrencies. - Fast and easy KYC/AML verification process. - Invest in high-performing bundled portfolio with a single click. Learn more on Christmas images and updates and feel free to get christmas images free ideas. Learn more on new year updates and feel free to happy new year 2019 download for pc. Learn more on new year gifs images and updates and feel free to get the new year gifs for instagram. Learn more on new year images and updates and feel free to get the new year wallpaper free download for pc. Learn more on happy new year images and updates and feel free to get the new year image for pc. Learn more on new year wishes and updates and feel free to get the happy new year wishes for friends. Learn more on Oscar predictions and updates and feel free to get the 91 oscar nominees list 2019. That's very informative content which you have written throughout this blog page. In case you love downloading movies through torrents, have a look at LimeTorrents Unblocked that is the possible way to remove restrictions very easily. UP Board 12th Commerce Result 2019 In this article you check the UP Board 12th Result 2019. Uttar Pradesh Board 12th Result will be declared on April 2019. Students are able to check their results via online mode. Thank you so much for giving pieces of information. I am in love with your writting skills.. Zero Education is an educational website. It publishes university admission circulars of various national and international universities. It is to create university admission related educational material. It helps students to prepare themselves well for University Admission test. Here you get educational material for admission test of Dhaka University, Rajshahi University, Chittagong University and all other public and private universities in Bangladesh. Recently several college admission circular has been published. All of them are published in Zero Education. Majority of students apply for xi Class Admission. This year the admission circular has a new surprise. Full application procedure are given in the admission circular. See the details admission circular and total seat of affiliated colleges for admission 2019-2020. You can apply online for College Admission in Bangladesh. Students can apply online or Taletalk SMS System. But it is easy for online to apply HSC college admission 2019-20. There are many new opportunities for students. This time they get special discount for college admission. You can admit into any government and private college for HSC Admission. HSC Admission Circular 2019-2020 will be published very soon.